For 2008, the popular VTX1300 is now available fully decked out for cross-country travel straight from the factory in a turnkey package that's both stylish and functional over the long haul. For those seeking long-distance comfort along with exemplary engine performance and superior handling, the ST1300 earns high marks from riders all around the globe. The 2008 Honda Powersports Line-Up Is Here! American Honda Motor Company announced more additions today to its 2008 motorcycle, ATV, scooter and personal watercraft (PWC) products at the company's annual dealer convention in Anaheim, California. "Our theme at this year's show is Dream Team 2008 and Honda enthusiasts will be pleased to see the number of dreams we've brought to reality for 2008," said Honda Press Manager Jon Row. "We have a number of new flagships in various segments. Our best-selling VTX1300 is now available as a turnkey touring model. We're introducing an affordable, highly versatile, dual-sport bike, the CRF230L. The all-new TRX700XX introduces incredible power, comfort and handling to the high-performance ATV market. Two all new 1500cc four-stroke turbocharged AquaTrax with amazing power and handling will delight our PWC fans. " "We are also especially pleased to early announce the 2009 Big Red, Honda's first entry in the MUV (multi-use vehicle) side-by-side market. With the introduction of Big Red, it will soon be clear to our customers that Honda understands their needs better than any other manufacturer in the side by side market." American Honda's powersports product line now encompasses 58 models, many of them all new or significantly redesigned. 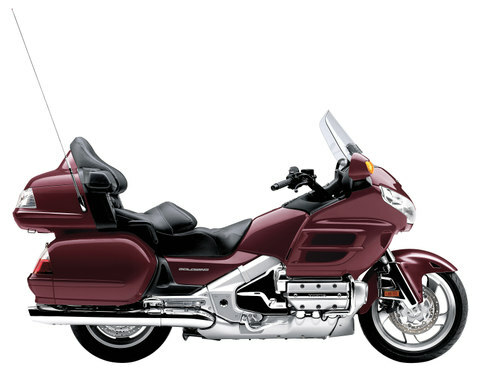 For 2008, the popular VTX1300 is available right off the showroom floor in full touring trim with a stylish, full-size custom windscreen, chrome-padded backrest for passenger comfort and 24-liter leather saddlebags. Best of all, the turnkey package comes loaded straight from the factory. Offered in Black, Metallic Silver and Metallic Red. The CRF230L is a compact and lightweight adventure-loving dual-sport motorcycle that can also do double duty as an economical commuter, motorhome runabout or weekend outback-exploration trail bike. With a dependable, torquey 223cc single-cylinder air-cooled four-stroke, electric starting, CRF-R-inspired bodywork/graphics and a user-friendly 267-pound curb weight (including all standard equipment, required fluids and a full tank of fuel), this is one street-legal machine that can do it all. Honda's championship-winning, Unicam engine-equipped CRF-R motocrossers and CRF-X dirt bikes receive numerous upgrades for 2008. Most notable is the addition of the lightweight HPSD (Honda Progressive Steering Damper) system to the CRF450R/X and CRF250R. Specifically designed for the rigors of motocross and off-road riding, HPSD improves handling and reduces rider fatigue. Races are won or lost in the corners. Thanks to the exclusive advantage of HPSD, all three models are now fitted with new 22mm-offset triple clamps to further enhance cornering ability. Both motocross models benefit from numerous power-enhancing improvements and receive a revised Showa front fork with new damper rods and stiffer springs, plus rear shock valving that matches changes to the forks. The CRF450X features a HPSD setup tuned specifically for off-road use. It and the 250X both have new narrow-design fuel tanks for improved ergonomics and Dunlop 742FA front tires for improved turning feel and traction. All four models are also equipped with works-type front and rear brake discs to reduce unsprung weight. Offered in Red, the CRF450R and CRF250R are also available in a special 2008 Black color, a limited color run of less than 500 units per model. The TRX700XX re-defines the ATV Sport category with heretofore unobtainable levels of engine performance, handling, comfort and confidence. With double-wishbone independent rear suspension (IRS), a unique, centered, chain drive system and an all-new fuel-injected, liquid-cooled 686cc engine churning out monstrous torque, the TRX700XX is the new Sport ATV "King of the Hill." For highly experienced riders 16 years of age and older, the TRX700XX is offered in Metallic Black/Silver and Metallic Black/Red. The sporty TRX400EX receives revised suspension components and settings, a lighter clutch pull for all-day riding comfort, a wider seat with a narrower seat/tank junction for improved ergonomics, aggressive, new next generation bodywork, long life LED brakelight and taillight. For highly experienced riders 16 years of age and older. Offered in Red/Black, Black/White. Each version is built around a powerful turbocharged 1470cc fuel-injected dry-sump four-cylinder engine pumping out 200 bhp and matched to a special, hydrodynamically designed hull for optimum performance. The new hull allows incredible acceleration and fast planing, while delivering an improved ride, better steering feel and more splash protection. The F-15X is available in Pearl White/ Metallic Silver and Bright Blue Metallic. The GPScape- model features a built-in waterproof GPS unit with storage for up to 100 waypoints and a digital compass function indicating travel direction. Offered in Candy Red and Bright Blue Metallic. Honda enters the MUV market with a side-by-side machine that leapfrogs the competition to set new standards in utility and recreation. With numerous automotive-based technologies, Big Red features a powerful 675cc OHV liquid-cooled PGM-fuel-injected single-cylinder engine and an automatic transmission with three selectable drive modes plus Reverse, front and rear independent double-wishbone suspension, a roomy cab featuring rubber-mounted bucket seats with adjustable backs, and a specially designed, highly durable, tilting cargo bed. A broad selection of Honda Genuine Accessories will also be offered. Big Red will be available in the Summer of 2008. The popular VTX1800 is offered in the sporty F-style, neo-retro N-version and T-type Tourer. All three versions are available in two distinctive build variations, and numerous Genuine Honda Accessories ensure that each VTX version can be custom-tailored like no other cruiser on the market. The VTX1800F is available in Black and Candy Red Tribal; the VTX1800N is available in Black, Dark Orange Metallic (Spec 1), Black with Black Custom Art, Dark Orange Metallic (Spec 2); and the VTX1800T is offered in Black, Black/Candy Black Cherry and Black/Metallic Blue. For those seeking long-distance comfort along with exemplary engine performance and superior handling, the ST1300 earns high marks from riders all around the globe. Available in Candy Dark Red. This muscular V-twin custom follows in the footsteps of the awesome VTX1800 and delivers distinctive custom styling and loads of torque in a high-value package. For 2008, VTX1300R & C models feature a sleek restyled two-into-two exhaust system with bullet-style mufflers for a classic custom look. The VTX1300R also features stylish chrome side covers. The VTX1300R is offered in Black, Pearl White, Dark Blue Metallic and VTX1300C colors include Metallic Black, Metallic Silver, Candy Red, Pearl Yellow. The quintessential sport touring motorcycle for sport bike riders, the Interceptor stands far above all others thanks to its exemplary handling, high-performance VTEC engine, all-day comfort and long-range amenities. Offered in Metallic Silver. In addition to the Black, Metallic Silver, Candy Dark Red/Flame and Ultra Blue Metallic/Flame color schemes introduced earlier, the Shadow Spirit 750 C2 will also come in a 2008 special color of Metallic Silver/Flame that will be produced in a limited color run of less than 500 units. A winner on the racetrack and in magazine comparison tests, the light, compact and powerful Honda CBR600RR raises performance standards to new heights in the middleweight class. Exciting new color schemes include Red/Black, Pearl Orange/Black, Metallic Silver, and Graffiti. The Nighthawk is where full-size motorcycling meets small-sized budgets in a lightweight, easy-to-handle package. Whether the day calls for work or for fun, the ready-and-willing Rancher is a great partner from sunup to sundown. Available with economical manual shifting or push-button shifting with Honda's Electric Shift Program (ESP). New Yellow color joins Red and Olive. Talk about tough customers, the 420cc FourTrax Rancher 4x4 cranks up outdoor adventures with a full list of features including selectable 4WD/2WD TraxLok, torque-sensitive front differential and fuel injection, plus the option of Honda's Electric Shift Program. New Black color joins Red, Olive and NaturalGear™ Camouflage. This rugged mid-size ATV continues to be a best seller thanks to its stylish appearance, get-it-done credentials and the option of manual or push-button electric shifting. New Blue color joins Red and Olive. For performance that stands tall in the world of scooters, Honda's Silver Wing offers an innovative blend of high performance, easy operation and distinctive styling. New Metallic Grey color. With the Metropolitan scooter, riders looking for economical transportation and easy-to-operate features can also enjoy a fun and fashionable ride that comes in a variety of styles and colors. Available in Ruby and new colors: Ocean, Monza and Gothic. An economical scooter that has plenty of attitude and a too-cool look, the Ruckus stands out from the two-wheel crowd. Metallic Silver joins Black for 2008 colors. American Honda Motor Co., Inc. is the sole distributor of Honda motorcycles, scooters, ATVs and personal watercraft in the U.S. American Honda's Motorcycle Division conducts the sales, marketing, and operational activities for these products through authorized Honda dealers. For detailed information, visit www.hondanews.com. Introducing the CRF230L, a compact and lightweight adventure-loving dual-sport machine that willingly serves as an economical commuter, motorhome runabout or weekend outback-exploration vehicle-this is one bike that can do it all. Winning magazine shootouts as well as the hearts of serious off-road riders, the CRF250X offers a rare combination of light weight and tractable power in one of the best handling packages in the off-road world. By winning the world-renowned Baja 500 and Baja 1000 races, the immensely popular CRF450X has earned its crown as the new King of Baja, and now in 2008 it grows more versatile than ever before. Innovative design has made Honda's dual-muffler CRF 250R the winner of Transworld magazine's 250cc four-stroke "Motocross Bike of the Year" for four years in a row. Honda's championship-winning CRF450R continues as one of the most versatile motorcycles in the world, earning Cycle World magazine's "Ten Best" status six years in a row.